It was a treat to watch Mark Wood bowling at a terrific pace and swinging the ball. The England cricket team is being relentless in the pursuit of a win in the 3rd Test against the Windies in St Lucia. Courtesy a 5-wicket haul from Mark Wood and a 4-wicket haul from Mooen Ali, the visitors are in the driver’s seat at the moment. Both the teams lost a flurry of wickets in the first two sessions of day-2 as England resumed their first innings, to start things off. Ben Stokes and Jos Buttler, who stitched together a wonderful partnership to put the Brits back on track, failed to capitalise on it. Buttler walked back to the pavilion without adding any runs to his tally while Ben Stokes was dismissed for 79. With Jonny Bairstow and Moeen Ali also failing to deliver, England lost the last six wickets for just 41 runs. The team was bowled out to 277 in the first innings. 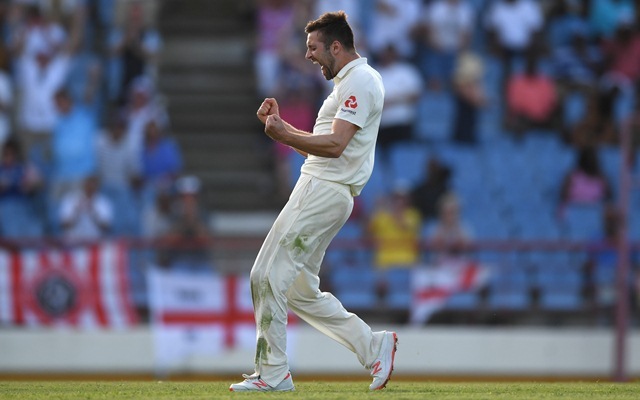 As the Windies began batting in the second innings of the match, they found a new nemesis in the form of Mark Wood. First, Moeen Ali dismissed both the openers off consecutive balls to hit the first nail in the coffin. Then Wood, the fourth change bowler, breathed, fire swinging the ball miles and consistently bowling over 90 mph. Even he dismissed both Shai Hope and Roston Chase off consecutive deliveries. The pacer completely blew the middle-order apart as Moeen Ali picked another two wickets from the other end. Shane Dowrich was the best man for Windies with the bat with a gritty 38. But just as he was looking to get his team to a respectable total, Stuart Broad trapped him plumb in front. Mark Wood hit the final nail in the coffin by dismissing Shannon Gabriel. In the process, he picked his fifth wicket and helped bowl Windies out for 154. The English openers Keaton Jennings and Rory Burns managed to survive the final ten overs of play on the day. With a lead of 142 and 10 wickets left in the bank, it is now up to the English batsmen to decide where this game will head. Twitterati was overjoyed watching Mark Wood bowl those rockets and also commended Moeen Ali for the brilliant spell. Broads position in the team needs to be put under threat more often..
Last test he steamed in and had a point to prove. He was excellent. Granny now said , the English only on top cause them ban tee Lil boi Holder 🤣🤣🤣🤣 ok granny ok 🤣🤣🤣 even the elders know it 🤦🏾‍♂️🤦🏾‍♂️ young and old knows they love to oppress 🤷🏾‍♂️ #WIvENG but good dead rubber nevertheless 😝 .